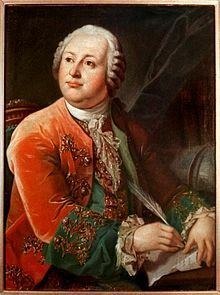 Mikhail Vasilyevich Lomonosov (Roushie: Михаи́л Васи́льевич Ломоно́сов; November 19 [A.S. November 8] 1711 – April 15 [A.S. Aprile 4] 1765) wis a Roushie polymath, scientist an writer, who made important contreibutions tae leeteratur, eddication, an science. Amang his discoveries wis the atmosphere o Venus. His spheres o science wur naitural science, chemistry, pheesics, mineralogy, history, airt, filology, optical devices an ithers. Lomonosov wis an aa a poet an influenced the formation o the modren Roushie leeterar leid. This page wis last eeditit on 4 November 2015, at 05:16.